Disney is always coming up with new experiences for guests to try during their trip. The newest experience will take guests on a train ride in Animal Kingdom. 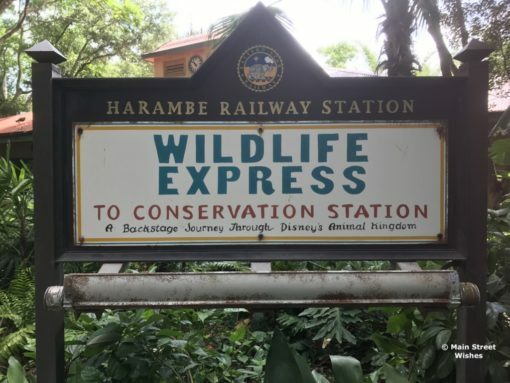 Guests will be welcomed at the Wildlife Express Train Station with a welcome reception, which includes alcoholic and non-alcoholic beverages, hors d’oeuvres, and snacks. Next guests will board the train and head to Rafiki’s Planet Watch for more snacks and drinks and a meet and greet with Timon and Rafiki. Once the snacks and meet and greets are done guests will board the train again and head over to Harambe Market for the main event of this experience. During the party at the marketplace there will be a variety of food and drinks to choose from. Another part of this experience is learning the importance about the Big Five game animals. Disney helps guests to understand the challenges that these animals face around the world and explains how they are working to protect them. Price: $125 plus tax for adults and $99 plus tax for kids ages 3-9. Reservations open to the general public on April 3. Annual Passholders and Disney Vacation Club Members can start making reservations on on April 2. Separate theme park admission is required for this dining experience. This sounds like it could be a fun event, but with the $125 and $99 price tags, this can add up to a lot of money for a family. Disney has quite a few extra ticketed events like this and some of them might be a little less. So if you want to try an event like this it’s worth checking out ones that are less expensive. It will be interesting to see in better detail what is included, once this experience is up on the website. What do you think? Does this sound like an experience you would try?